John A. Robinett was born circa 1863 at Illinois. He was the son of Bluford Robinett and Amanda Jane Rose. John A. Robinett died circa 1887. [S247] U.S. Federal Census 1870 U.S. Federal Census, by Ancestry.com, Page 3. Stamp 426. Dwelling 18. [S246] U.S. Federal Census 1880 U.S. Federal Census, by Ancestry.com, NA Film Number T9-0208 Page Number 579B. William Allen Robinett was born circa 1869 at Illinois. He was the son of Joseph Robinett III and Nancy Angeline Thompson. William Allen Robinett died before 1905. [S247] U.S. Federal Census 1870 U.S. Federal Census, by Ancestry.com, Dwelling 14. Van Potts was born circa 1858 at Kentucky. He was the son of Joseph Potts and Phoebe Robinett. [S247] U.S. Federal Census 1870 U.S. Federal Census, by Ancestry.com, Dwelling 142. Page 20. [S246] U.S. Federal Census 1880 U.S. Federal Census, by Ancestry.com, Page 22. ED 38. Dwelling 158. Name Variation Charlie C. Zinn was also known as Charley. Charlie C. Zinn was born circa 1869 at Kentucky. [S186] Illinois, Illinois Statewide Marriage Index, Vol 00E/ Page 0491. [S243] U.S. Federal Census 1920 U.S. Federal Census, by Ancestry.com, ED32. Dwelling 151. [S250] U.S. Federal Census 1930 U.S. Federal Census, by Ancestry.com, ED30-3. Dwelling 120. Married Name Her married name was Leavell. Angie Zinn married Samuel E. Leavell. Angie Zinn was born circa 1903 at Illinois. She was the daughter of Charlie C. Zinn and Laura J. Robinett. Samuel E. Leavell married Angie Zinn, daughter of Charlie C. Zinn and Laura J. Robinett. Samuel E. Leavell was born circa 1901 at Illinois. Nigel Zinn was born circa 1909 at Illinois. Married Name 23 February 1867 As of 23 February 1867,her married name was Cahill. Bridget Walsh was born circa 1848 at Ireland. She was the daughter of Peter Walsh and Catherine Curran. Bridget Walsh married Thomas Cahill, son of Dennis Cahill and Anna Riley, on 23 February 1867. [S248] U.S. Federal Census 1860 U.S. Federal Census, by Ancestry.com, Page 150. Stamp 508. Dwelling 1138. [S247] U.S. Federal Census 1870 U.S. Federal Census, by Ancestry.com, Page 11. Stamp 42. Dwelling 74. Guido Baumbach Sr. was the son of (?) Baumbach. Children of Guido Baumbach Sr.
Guido Baumbach Jr. was born on 1 March 1825 at Stadt Weimer, Saxony, Germany, twin with Henry. He was the son of Guido Baumbach Sr.
Guido Baumbach Jr. married Dorthea Elizabeth Katzman, daughter of (?) Katzman, circa 1851. Guido Baumbach Jr. died on 21 July 1903 at age 78.
and SELLS Circus Band and played for Lincoln's inaugural ball. [S248] U.S. Federal Census 1860 U.S. Federal Census, by Ancestry.com, Dwelling 823. [S247] U.S. Federal Census 1870 U.S. Federal Census, by Ancestry.com, Pages 15-16. Stamp 491. Dwelling 114. [S246] U.S. Federal Census 1880 U.S. Federal Census, by Ancestry.com, Page 19. ED105. Dwelling 184. [S245] U.S. Federal Census 1900 U.S. Federal Census, by Ancestry.com, ED89. Dwelling 20. Name Variation Dorthea Elizabeth Katzman was also known as Elizabeth. Married Name circa 1851 As of circa 1851,her married name was Baumbach. Dorthea Elizabeth Katzman was born in December 1831 at Saxony, Germany. She was the daughter of (?) Katzman. Dorthea Elizabeth Katzman married Guido Baumbach Jr., son of Guido Baumbach Sr., circa 1851. Dorthea Elizabeth Katzman died before 1925. Dorthea Elizabeth Katzman immigrated in 1838. She had 10 with 8 living in 1900 children. Children of Dorthea Elizabeth Katzman and Guido Baumbach Jr.
Casper Baumbach was born at Germany. He was the son of (?) Baumbach. Name Variation Delia W. Lueck was also known as Luek. Name Variation Delia W. Lueck was also known as Riek. Name Variation Delia W. Lueck was also known as Otillie W.
Married Name 13 February 1882 As of 13 February 1882,her married name was Baumbach. Delia W. Lueck was born in July 1859 at Germany also reported as Jul 1860. She was the daughter of August Lueck Sr.
Delia W. Lueck was buried in 1944 at St.John’s Evangelical Lutheran Cemetery, Monroe, Wisconsin. Delia W. Lueck immigrated in 1878. She had 7 with 7 living in 1900 children. She had 7 with 7 living in 1910 children. [S5] Wisconsin, Wisconsin Marriages, 1835-1900, Spouse listed as: DELIA LUEK. [S245] U.S. Federal Census 1900 U.S. Federal Census, by Ancestry.com, ED93. Dwelling 201. [S244] U.S. Federal Census 1910 U.S. Federal Census, by Ancestry.com, ED147. Dwelling 26. [S243] U.S. Federal Census 1920 U.S. Federal Census, by Ancestry.com, ED134. Dwelling 90. [S250] U.S. Federal Census 1930 U.S. Federal Census, by Ancestry.com, ED40. Dwelling 62. Name Variation George Heinrich Baumbach was also known as Georg Heinrich. George Heinrich Baumbach married Gertie A. (?). George Heinrich Baumbach was born on 22 July 1884 at Wisconsin. He was the son of Guido Baumbach and Delia W. Lueck. George Heinrich Baumbach died in October 1964 at age 80. 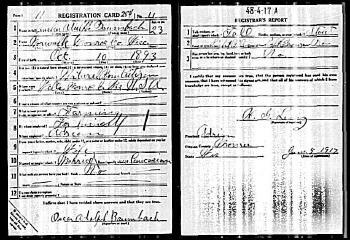 George Heinrich Baumbach obtained US Social Security Card at Wisconsin; last residence not specified. [S243] U.S. Federal Census 1920 U.S. Federal Census, by Ancestry.com, ED143. Dwelling 67. Elmer August Baumbach was born in February 1890 at Wisconsin. Elmer August Baumbach married Lily (?) circa 1915. Elmer August Baumbach was buried in 1931 at St.John’s Evangelical Lutheran Cemetery, Monroe, Wisconsin. [S243] U.S. Federal Census 1920 U.S. Federal Census, by Ancestry.com, ED144. Dwelling 16. [S250] U.S. Federal Census 1930 U.S. Federal Census, by Ancestry.com, ED41-34. Dwelling 96. Name Variation Julius Herman Baumbach was also known as Julian. Julius Herman Baumbach was born in September 1891 at Wisconsin. Julius Herman Baumbach married Elizabeth (?) circa 1915. Julius Herman Baumbach married Myrtle Sadd circa 1926. Julius Herman Baumbach died in 1932. He was buried in 1932 at St.John’s Evangelical Lutheran Cemetery, Monroe, Wisconsin. [S243] U.S. Federal Census 1920 U.S. Federal Census, by Ancestry.com, ED150. Dwelling 72. Oscar Adolph Baumbach was born on 10 October 1893 at Wisconsin. Oscar Adolph Baumbach married Myrtle Nichols on 4 November 1914. Oscar Adolph Baumbach died in 1965. He was buried in 1965 at St.John’s Evangelical Lutheran Cemetery, Monroe, Wisconsin. On 5 June 1917 at World War I Draft Registration, Monroe, Wisconsin. On 27 October 1964 Oscar and Myrtle Nichols Baumbach 50th wedding anniversary article. [S243] U.S. Federal Census 1920 U.S. Federal Census, by Ancestry.com, ED118. Dwelling 82. Robert Richard Baumbach was born on 22 February 1900 at Wisconsin twin with Rueben; also reported as Feb 1899. Robert Richard Baumbach was buried in November 1950 at St.John’s Evangelical Lutheran Cemetery, Monroe, Wisconsin. He died in November 1950 at age 50. Name Variation Reuben Reinhard Baumbach was also known as Rubbie. Reuben Reinhard Baumbach was born on 22 February 1900 at Wisconsin twin with Robert; also reported as Feb 1899. Reuben Reinhard Baumbach married Theresa Christina Kronberg, daughter of George Kronberg and Roberta Miller, circa 1919. Reuben Reinhard Baumbach died in January 1990 at age 89. [S250] U.S. Federal Census 1930 U.S. Federal Census, by Ancestry.com, ED31. Dwelling 115. Name Variation Delia Fredricka Schmalz was also known as Ottillia. Married Name circa 1883 As of circa 1883,her married name was Baumbach. Delia Fredricka Schmalz was born in October 1860 at Germany. She was the daughter of Michael Schmalz and Henrietta Prell. Delia Fredricka Schmalz married George H. Baumbach, son of Henry B. Baumbach and Martha Catherine Katzman, circa 1883. She died in 1926 at Wisconsin. Delia Fredricka Schmalz immigrated in 1880. She had 7 with 6 living in 1900 children. [S310] Wisconsin, St. Jacob Evangelical Lutheran Cemetery, Monroe WI. [S245] U.S. Federal Census 1900 U.S. Federal Census, by Ancestry.com, ED93. Dwelling 251. Emma Baumbach was born in February 1885 at Wisconsin. She was the daughter of George H. Baumbach and Delia Fredricka Schmalz. Minnie Baumbach was born in September 1890 at Wisconsin. Edward A. Baumbach was born in February 1888 at Wisconsin. He was the son of George H. Baumbach and Delia Fredricka Schmalz. Herman H. Baumbach married Eva E. (?). Herman H. Baumbach was born on 14 April 1896 at Wisconsin. Herman H. Baumbach was buried in July 1983 at Pilgrims Home Cemetery, Monroe, Wisconsin. He died in July 1983 at age 87. Herman H. Baumbach obtained US Social Security Card at Wisconsin; last residence Norwalk, Monroe, Wisconsin. [S243] U.S. Federal Census 1920 U.S. Federal Census, by Ancestry.com, ED150. Dwelling 6. Otto Adolph Baumbach was born on 5 September 1898 at Wisconsin. Otto Adolph Baumbach married Margaret Mae Oliver, daughter of James Edward Oliver and Emma Gerred, in 1919. Otto Adolph Baumbach died in July 1976 at Wisconsin at age 77. Otto Adolph Baumbach obtained US Social Security Card at Wisconsin; last residence Marshfield, Wood, Wisconsin. [S250] U.S. Federal Census 1930 U.S. Federal Census, by Ancestry.com, ED37-35. Dwelling 230. Ida Baumbach was born on 19 September 1893 at Wisconsin. Married Name Her married name was Woodliff. Martha Catherine Baumbach was born on 29 September 1904 at Norwalk, Monroe, Wisconsin. Martha Catherine Baumbach died on 23 June 1991 at LaCrosse, LaCrosse, Wisconsin, at age 86. Married Name 13 September 1875 As of 13 September 1875,her married name was Baumbach. Mary Jones was born in August 1855 at Wisconsin. She married John Henry Baumbach, son of Henry B. Baumbach and Martha Catherine Katzman, on 13 September 1875 at Monroe, Wisconsin. Mary Jones was buried in 1941 at Woodlawn Cemetery, Monroe, Wisconsin. Mary Jones had 5 with 4 living in 1900 children. [S245] U.S. Federal Census 1900 U.S. Federal Census, by Ancestry.com, ED93. Dwelling 250.